Peter argues that more than anything else we need to find life through forgiveness and to find fulfillment through righteousness — and this is our future hope. It is this hope that he wants us to remember such that we let it change our lives today. Peter is writing to churches which are troubled by false teachers who are distorting the apostolic gospel and deceiving believers into leading immoral lives. In 2 Peter 1, Peter insisted that the apostolic gospel is a revelation from God and that believing the gospel results in a lifestyle marked by a pursuit of godliness. In 2 Peter 2, Peter says God will judge surely the false teachers and those who rebel against Him, but He will rescue His people. In 2 Peter 3, Peter begins to close and summarize the letter. Scholars have speculated that Peter wrote a third letter we are missing and Peter refers to the missing letter in 3:1-2. I follow tradition and think the two letters he refers to are the two letters we have in Scripture. He wants to stir up their minds by way of reminder as he said in 2 Peter 1:12-15. The Old Testament prophets and the apostles of Jesus Christ spoke the same message. The prophets looked forward to the coming Messiah. The apostles look back on the coming of the Messiah. This past message produces a hope for the future. What Christ did in the past at his first coming produces our future hope for what he will do at his second coming. Understanding our future hope changes the way we live in the present. We are urged to seek godliness now because godliness is our destiny. We see these same themes in 1 Peter. 2 Peter addresses the problem of false teachers presenting themselves as fellow believers. 1 Peter addressing the suffering at the hands of unbelievers. 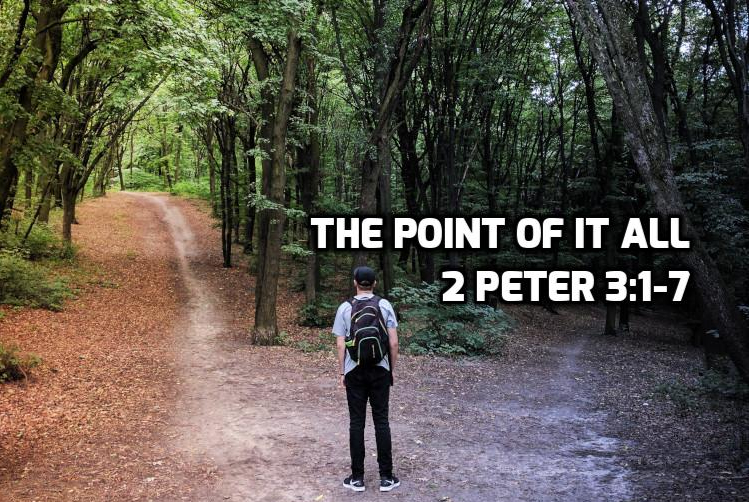 But Peter applies the same truth to both situations. Compare to 1 Peter 1:10-16. It’s important to remember the words of the apostles because mockers will scoff at your hope of Christ’s return. “in the last days” – Peter means the time between Christ’s first coming and his return. The scoffers want to follow their own sinful desires now. They discourage the belief that Jesus is coming back, because if you believe Jesus will return, you would follow a different lifestyle. The mockers argue that because Jesus has not returned yet, he never will, and life will continue as normal forever. Peter argues the mockers have misread history. We’ve already seen two cataclysmic events: 1) creation and 2) the flood. Both of these events came about by the word of God. If God says there will be a third cataclysmic event, we should believe Him. Peter wants remind his readers to embrace what the prophets and apostles taught about the Messiah. We will not understand our present situation unless we firmly understand what Jesus did in the past and what he will do in the future. Mockers will scoff at our hope, and they ridicule the idea that this world will ever change. Peter responds God created this world and God can destroy it. God has decreed that one day this present earth and all the ungodly rebels on it will be destroyed, and be replaced with a new creation, and so it will. Sometimes the church is highly interested in the second coming and times we ignore it. Yet Peter would argue what we believe about the future shapes how we live today. More than anything else we need to find life through forgiveness and to find fulfillment through righteousness — and this is our future hope. We should set our minds on this hope and let it change our lives today.